Create a contemporary office space by starting with a clean slate. Black is generally the most preferred for office furniture; however there are other colors which can help you design your office in the most vibrant manner. Other than black; blue and white could also be helpful in revamping your office and give it a contemporary look. One can always choose from various hues of blue and white in contrast with other colors as well. A neutral color such as white comes in as many varieties as its colorful counterparts and it can turn out to be just as interesting. Diverse textures in a simple white color will add a unique kind of charm to the place along with making the entire space appear as calm and passive. An added advantage with this color is that it leaves zero room for distractions. White paint colors will make your wall décor and statement furniture pieces stand out. In the startup culture, offices prefer bright colored furniture to reduce the dullness of work environment. If a couch such as Avvio with pastel blue color is placed against a white backdrop, it will add a pinch of standout color in the entire setup. To sum up, it can be said that white offers you the maximum creative space to design the interior of your office as per the latest trends. Blue color is said to have a positive impact on the productivity of employees. One of the major advantages with blue is that one can use its different hues to design the office and it will not turn out to be monotonous. It is a known fact that blue and white turn out to be the ultimate color combination to design an office space with just a right pinch of required bright color. A director’s cabin with a blue wall and white executive chair such as Kenzo will add the essential bit of elegance in the space. 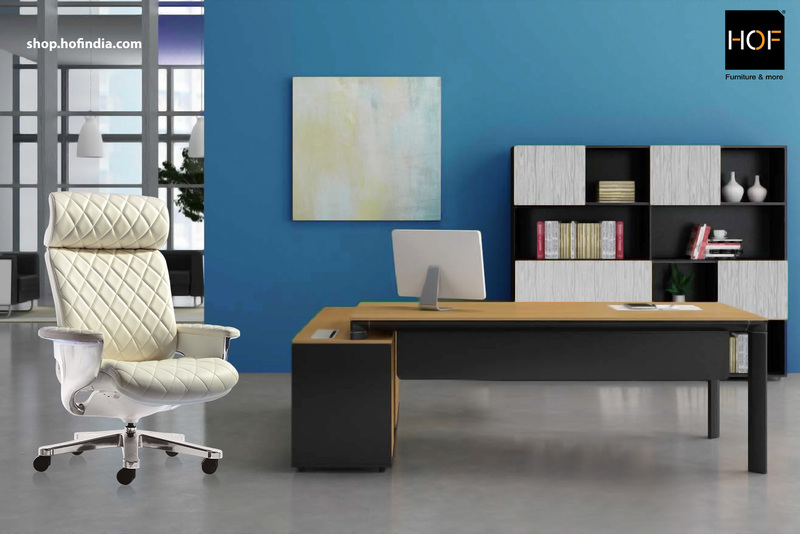 Looking for ergonomic office furniture with a contemporary design? Visit shop.hofindia.com now!